By AD 600, the Angles and Saxons had conquered and settled much of what would become England. The remaining unconquered former Britons, their post-Roman civilisation having collapsed to a very large extent, had transformed in just two tumultuous centuries into the Early Welsh. Their language changed considerably in that time to reflect the collapse of their civilisation and their increasing isolation, becoming different even from the language of other British kingdoms outside of Cymru. From this point onwards, they were never in the ascendant, merely surviving for the most point as their eastern borders were gradually compressed. Between the late 600s to the early 800s, Cymru was relatively inactive and detached from British and Continental affairs. The arrival of Mervyn Vrych in Gwynedd began a chain of peaceful changes that saw the kingdoms united under Rhodri Mawr in the middle of the ninth century. 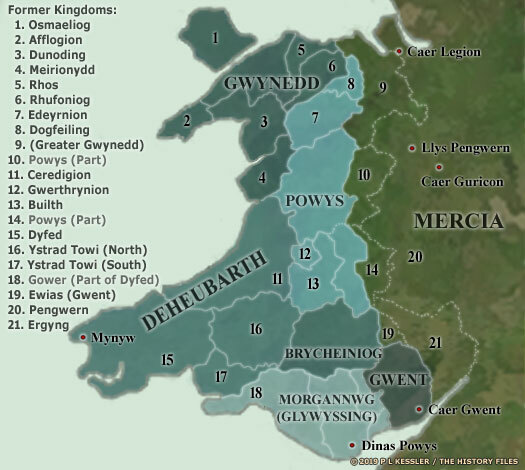 As sub-kingdoms were formed for his sons, some former states such as Dogfeilion and Ceredigion found themselves part of what were once rival kingdoms. English pressure on the eastern border had virtually halved the territory of Powys by the middle seventh century, once Pengwern had fallen, and its northern region, together with Gwent's Ergyng (Ercing) province, had both fallen to the Mercians. This virtually set Cymru's borders, with only small pockets of land being regained before the modern division between England and Wales was confirmed.